Richard Stockton was born near Princeton, on October 1, 1730. He attended the West Nottingham Academy under Dr. Samuel Finley, and then earned his degree at the College of New Jersey (Now Princeton) in 1748. He studied law with David Ogden of Newark. 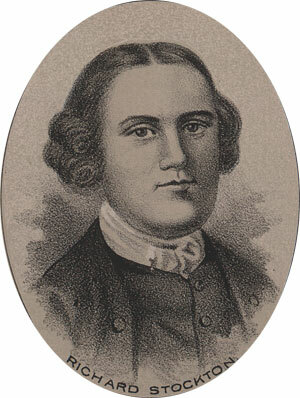 Stockton became an eminent Lawyer with one of the largest practices in the colonies. He was not much concerned with politics, but applied his talents and person to the revolutionary cause when the day came. He was appointed to the royal council of New Jersey in 1765 and remained a member until the government was reformed. He was a moderate with regard to Colonial autonomy. He argued that the colonies should be represented in the Parliament. With the passage of the Stamp Act, such arguments were overcome by colonial backlash. In 1774 he was appointed Justice of the Supreme Court of New Jersey. In 1776, the New Jersey delegates to the Congress were holding out against Independence. When news of this reached the constituents, New Jersey elected Richard Stockton and Dr. Witherspoon to replace two of the five New Jersey delegates. They were sent with instructions to vote for Independence. Accounts indicate that, despite clear instruction, Justice Stockton wished to hear the arguments on either side of the issue. Once he was satisfied, the New Jersey delegates voted for Independence. Stockton was appointed to committees supporting the war effort. He was dispatched on a fact finding tour to the northern army. New Jersey was overrun by the British in November of '76, when he was returning from the mission. He managed to move his family to safety, but was captured and imprisoned by the British. He was not released until several years later, badly treated and in very poor condition. He was taken to Perth Amboy where he was jailed. Stockton was then moved to Provost Prison in New York where he was intentionally starved and subjected to freezing cold weather. After nearly five weeks of abusivel treatment, Stockton was released on parole, his health was battered. He returned to his estate, Morven, in Princeton, which had been occupied by General Cornwallis during Stockton's imprisonment. All his furniture, all household belongings, crops and livestock were taken or destroyed by the British. His library, one of the finest in the colonies, was burned. To earn a living Stockton reopened his law practice and taught new students. Two years after his parole from prison he developed cancer of the lip that spread to his throat. He was never free of pain until he died on February 28, 1781.